Owning a woodland property in rural Ontario means that you are more likely to be affected by natural disturbances such as forest fire. It is important to take steps on your property and in your community to reduce the risks from wildfire. If a forest fire occurs in your community, report it immediately. 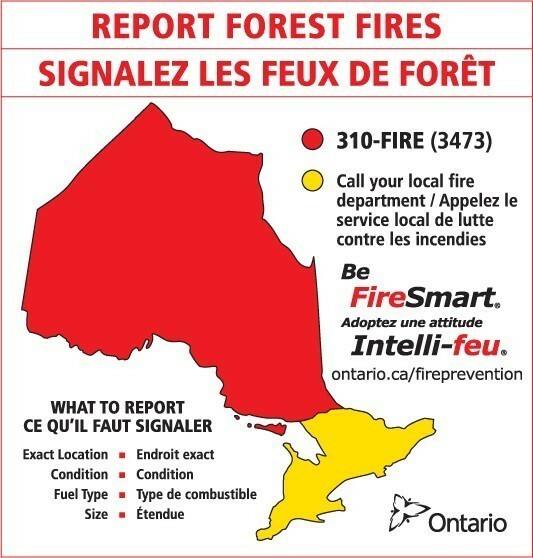 310-FIRE (3473) is the new, toll-free number across northern Ontario. The number will operate north of the French and Mattawa Rivers. It is not available for satellite phones or from phones outside the province; calls from these locations should go to local fire departments.